So, you’ve set up your Magento store, and everything is all good. All the products are in, and you’ve got your first few sales. Except, why does the order say processing? And how do you get this to say completed? I’ve read in a few forums many people wondering why this process isn’t easier, giving the user the ability to just select the order, and from a drop down menu to change the status of the order from processing, to packaging, to shipping, to completed. I have read of some hard-coding techniques, which I won’t get into here. I have also heard of some plugins or addons the Magento that aren’t free, that might work, which I also won’t get into here. Rest assured, there is a method to Magento’s madness, it’s just… kind of madness.. But, I am here to help you understand this process. Let’s assume that the order has been placed already, and by selecting sales -> orders from the top menu in the admin panel, you will see your orders layed out for you. The first step in the process is to invoice the order. To do this, while in the orders page click on the order you would like to invoice. This will bring you into the page where you will see an option at the top to invoice. 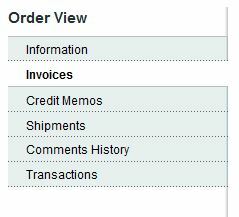 Once inside this invoice page, you will see an option if you scroll to the bottom to submit the invoice. But, before you do this, just above this, you are given a drop down list with three options. Capture offline, capture online, and not capture. Capture Online – When the Invoice is submitted, the system will capture the payment through the third party payment gateway. You will have the ability to create a Credit Memo, or Void the Invoice. Capture Offline – When the Invoice is submitted, the system will not capture the payment. It will be assumed that the payment is going to be captured directly through the gateway, and you will no longer have the option to capture this payment through Magento. You will have the ability to create a Credit Memo, but you will not have the option to Void the Invoice (even though the Order used an online payment, the Invoice is essentially an offline Invoice). Not Capture – When the Invoice is submitted, the system will not capture the payment. However, it will be assumed that you will capture the payment through Magneto at a later date. 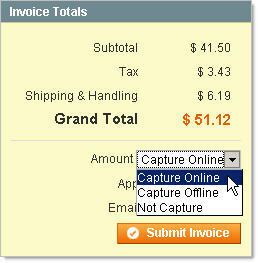 Therefore, there will be a Capture button in the completed Invoice. Before capturing, you will be able to cancel the Invoice, and after capturing, you will be able to Credit Memo and Void the Invoice. Note: Do not select Not Capture from the drop-down unless you are certain that you are going to capture the payment through Magento at a later date. You will not be able to create a Credit Memo until the payment has been captured using the Capture button. I find if a customer pays online with paypal, the status of the order will still be stuck in processing, so it’s necessary for me to select capture offline here most of the time. As stated, this assumes that you will get the order payment in other means. Note here that there is also an option to select email invoice to the customer, which happens upon clicking submit if selected. Now you click submit invoice and you should see your invoice in the invoice order view on the left menu. After doing this, you will be able to print the invoice (perhaps to a pdf) by selecting (there’s a check box) the order you just created an invoice for from the main orders page (top menu sales -> orders), and then from the actions dropdown menu in the top right, select print invoice. Step 1 allows you to get the payment for your product. I really don’t know why it doesn’t automatically do this when you get instant payment via. Paypal, because most customers I find do this. Perhaps there’s a plugin I’m not aware of. Step 2 is now shipping the item. After you ship the item, your order will show up as Completed on the orders page (top menu sales -> orders ). To complete a new shipment for an order, you must first select the order you wish to ship from the orders page, then in the top menu, you will see a shipment button to click. You will notice that this page is much the same as the invoice page, except it doesn’t have the total amount. Note again that there is an option here to select send an email to the customer that can be selected. Once this is done, click the submit shipment button. You will now be able to see the shipment document from the orders page left menu. You will also notice that your order now says complete, thus concluding this tutorial! To reference some Magento documentation head to their wiki Chapter 8. When the shipping method is FedEx, does Magento automatically arrange collection and delivery or is a 3rd party plugin required? Wonderful guide. Magento really does need to work on its userguide. Hello. I have never used the FedEx option on Magento, but I suspect that when you use the widget, it only works to get a quote on the shipping costs based on the weight and dimensions of the package you’ve entered into the details, and the final destination of the package. I would assume you would still have to bring the package into FedEx, or phone them to pick it up… But this is a logical guess. If you get an answer to this from experience, I’d love to hear back from you! Thanks Ned. That is my thinking too but no one seems to know the answer or, at least, no one in the Magento forums has provided an answer and none of the Magento FedEx plugin developers has given a clear answer. Looking at the FedEx sales flow process as documented on different websites has made me none-the-wiser; indeed, the owner of one blog deleted my question about it. I will share the answer when I get it. Thanks Lee. I think this would be a brilliant system to get going for any shipper. And in fact, this is what “drop shippers” technically should do, if they aren’t already.